December. 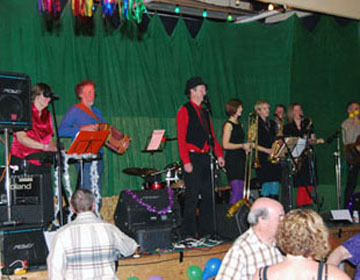 The year went out with a bang when the band played the Crook Morris Christmas ceilidh in Kendal for the third year running. Even the very wintry weather played its part to provide a seasonal feel to the night. The dancing was interspersed with excellent dance and song displays. To give a special flavour to the occasion, Les's three daughters provided a superb brass section, playing trombone, alto and tenor saxaphones.The band had a great time and it looked as if the dancers did too. September. Following their various holidays, the band got back into the swing of things with their second visit of the year to the Hawkshead Beer Hall in Staveley for the wedding of Ian and Clare Elleray. The great atmosphere of the Hall and Wilfs next door, together with a lively bunch of people and the various singing spots by their friends, made for a special evening. Ian said after the evening - Thanks again! We've had many comments last night and today on just how great you were and how much you contributed to what all report was a truly splendid event. One we won't forget! 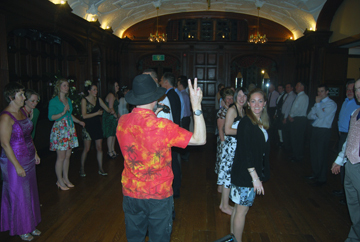 The second gig in September was in a new venue for the band, the Graythwaite Manor Hotel in Grange-over-Sands. The occasion was the 40th birthday, and 10th wedding anniversary, of David, shown below right. 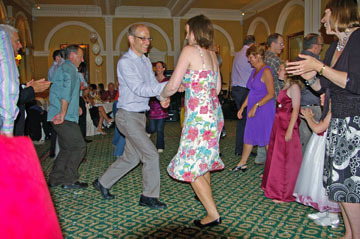 A good atmosphere, keen dancers, and helpful hotel staff all made for a lively evening. David said - Just wanted to say thanks for a fantastic gig on Saturday. I think everyone there enjoyed themselves. A good time was had by all. July. The band play occasionally at the Belsfield Hotel in Bowness, and this occasion was for the wedding of Jill and Tom. 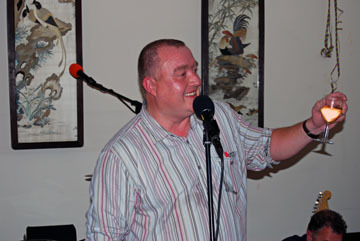 A great atmosphere with keen and lively people helped to make an excellent evening. On their return from their honeymoon, Jill said - This is a very belated huge thanks to you all for our wonderful wedding entertainment at the Belsfield. 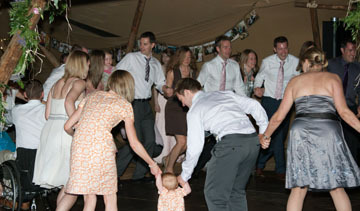 We have been away since the wedding and hence this is my first chance to email to say thanks and how much we enjoyed it: all our guests have said how much they loved the dancing and that the band really worked the floor! You made our day special so thanks! June. In the middle of the lovely spell of weather that the country was enjoying, Hornby held their five yearly town festival, and invited Tumbling Tom to play for their ceilidh. The hot weather impacted the turnout, but the band used their reportoire of songs and monolgues alongside the dancing to help entetain the audience. May. After a gap due to holidays, the band drove over to Kirkby Lonsdale to play for the wedding ceilidh of Emma and Mark. In a spell of superb weather, the evening event was held in a Lapland style marquee supplied by Papakata which must be seen to be believed. A great time was had by all, and Mark & Emma said afterwards - Thank you for all you did to help make the evening of our wedding so enjoyable. We all had a fabulous time dancing. April. The band moved up to Borrowdale at the end of the month to High House where they invite other musicians to spend the weekend playing music and walking on the fells with them. Always a special weekend, this year was no exception. The photo on the right shows some of the group on the Saturday evening in the common room. 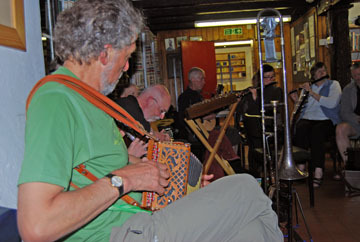 Hugh is on diatonic accordeon, Mike on guitar, Phil on hammered dulcimer, Sam on mandolin, Elaine on flute, Fiona on flute, and Pete on concertina, all sat round Jens trombone. March. Our first booking in March was at the Hawkshead Brewery Beer Hall in Staveley, a venue well worth checking out for atmosphere and great beer. Andrew and Rachel are friends of Tony our bass player, and the occasion was Andrew's 40th birthday. A fun evening with lots of people and delicious food. 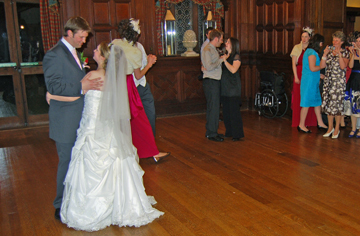 This was followed by the wedding of Alicia and Peter at the Netherwood Hotel. Alicia is the daughter of Jeff and Ann Pimblett, whose silver wedding we played for some years ago, so it was something of a re-union for the us. 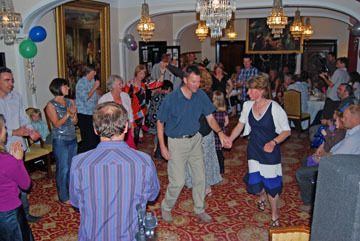 The enthusiasm of the guests coupled with the calling of Martyn Harvey made for a cracking evening. 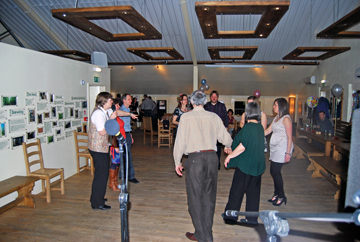 February started off with another retirement party, this time at Preston Patrick Memorial Hall. 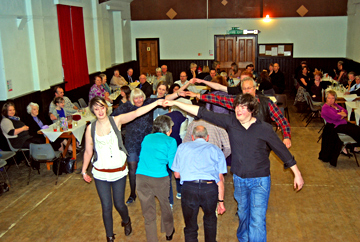 Cath and John had laid on some lovely food, and the photo on the right shows them well into the Double Gloucester Dance. Cath said afterwards -It was a very enjoyable evening and I have given your details to a number of people, two of whom are organising their wedding, so I hope something comes of it. I particularly liked the song you all sang. Entertainment during supper was provided by two guitarists - Matt Davenport and Greg Brown. 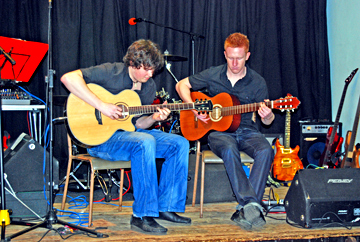 They are both final year students at UCLAN studying Music, and both demonstrated their obvious talents on their guitars. Our other gig in February was a return booking for K Fellfarers, the walking and climbing club that Hugh is a member of. 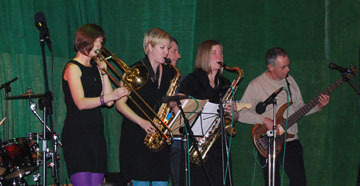 As with last year, it was at the Castle Street Centre in Kendal and another sell-out. A great night! First of all, the band would like to wish everyone a happy new year, and may everyone have lots of music and dancing in their lives. 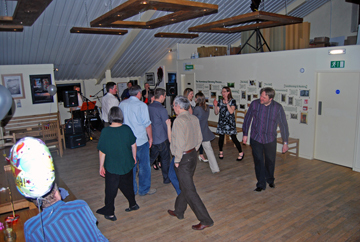 2010 started off in great style with a GP retirement party at one of our regular venues, Priest Hutton Village Hall. Thanks to Linda and her team for an excellent evening. We were due to play there again the following weekend, but unfortunately the event was cancelled due to illness.